22 January 2019 (Toronto, ON) - Sir Karl Jenkins, the most performed living composer, is celebrating his 75th birthday with a brand-new album, tour and a host of reissues from his immensely popular catalogue – all now available on Decca Records/Universal Music Canada, the country’s leading music company. The new album is entitled Piano and sees Sir Karl at the keyboard for the first time, performing original piano versions of his best-loved works as well as two new compositions. The album will be released on February 8 to coincide with Sir Karl’s UK tour which starts begins February 10 in his native Wales – just ahead of his 75th birthday on February 17. 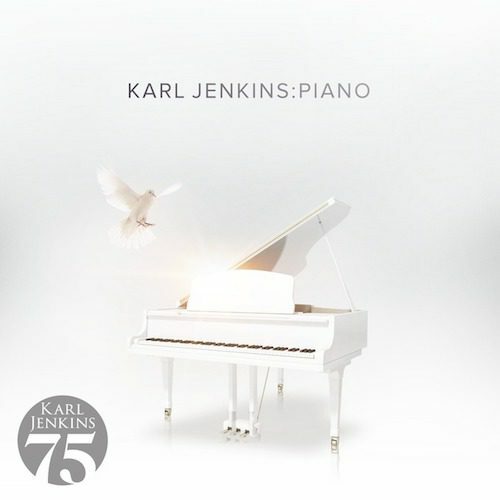 Sir Karl Jenkins’s prolific career spans the worlds of classical, jazz, TV and film music. His new album goes back to where it all started – composing beautiful melodies at the piano. Sir Karl’s new arrangements are drawn from across his choral and symphonic oeuvre, with piano versions of some of his most famous pieces including Adiemus, Palladio, “Pie Jesu” from Requiem and “Benedictus” from The Armed Man. There are also two completely new compositions: the jazz-influenced “Quirky Blue” and “White Water” – a flowing piano piece in which Sir Karl duets with his wife – Lady Jenkins, Carol Barratt. The whole album was produced by their son Jody Jenkins, making it a true family affair. Alongside the new recording, Decca is reissuing Sir Karl’s extensive catalogue with brand new artwork to mark his 75th birthday. The albums are all available now digitally and CDs will be released over the next four months, starting with The Armed Man, Requiem, Adiemus and The Very Best of Karl Jenkins on February 8. In addition to these new releases, fans of Sir Karl Jenkins will also be able to see him live as he conducts a series of concerts around the UK. Starting in Cardiff on February 10, he will be travelling to Glasgow (March 3), Birmingham (March 10) and Manchester (March 16), before appearing at Classic FM Live at London’s Royal Albert Hall on April 24. Sir Karl will be returning to the prestigious venue later in the year for a special 75th birthday concert on October 13 in which he’ll conduct some of his best-known works and selected extracts from his new composition, Miserere. He’ll be joined by mezzo-soprano Kathryn Rudge, organist Jonathan Scott, cellist Abel Selaocoe, Crouch End Festival Chorus and the Royal Philharmonic Orchestra for the celebratory event. Over 20 years ago, Sir Karl changed the way classical music was perceived as Adiemus – Songs of Sanctuary broke the chart music rule books. It caused a huge stir as the album was not considered eligible for the classical charts, despite its huge popularity among classical fans – selling a million copies worldwide in its first year. The album went on to achieve 17 Gold and 2 Platinum discs. Originally from the Gower peninsula near Swansea, Sir Karl Jenkins has been decorated with a considerable range of awards for his services to music, including an OBE, CBE, and a knighthood. There are over 250 performances per year of his work in more than 20 countries, and he has consistently been the highest placed living composer in Classic FM’s Hall of Fame. He released his autobiography, Still with The Music, in 2015. The Armed Man: A Mass For Peace, written for the millennium, is one of Sir Karl’s most well-known compositions, which has been in the UK classical charts for 15 years. It has been performed over 2500 times since its premiere in 1999, which equates to more than two performances a week! It has also been in the UK classical artist chart for nearly 800 weeks. Sir Karl’s style and integrity has always transcended musical boundaries, yet remained truly his own. His new album, Piano, is testament to the inventiveness of his melodies and enduring popularity of his music. It is also a fitting celebration of a legendary composer in his 75th year. Vocal scores and performing materials for are available from Boosey & Hawkes, exclusive publisher of Sir Karl Jenkins.